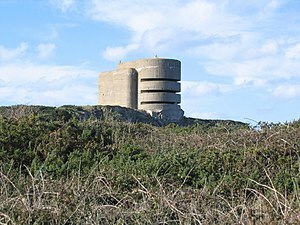 German WW2 bunker ‘The Odeon’ in Alderney. It is no exaggeration to suggest that part of Alderney’s heart and soul were ripped out during the Occupation of the island between 1940 – 1945. The island that was torn apart, the inhabitants stripped of their livelihood and the long haul to repair the damage the Germans had left behind, has left a lasting legacy to those who remain staunch Ridunians. Approximately nine miles from Normandy, 20 miles from Guernsey and 60 miles south of England, Alderney could be a million miles away from its neighbouring islands in the Bailiwick! Its quaintness and relaxed culture belies its somewhat sadistic past, but its beauty and tranquillity are laid bare for all to experience. The island, 3.5miles long and 1.5miles wide, covering approx 2000 acres, is the only “true” Channel Island, as it lies just on the edge of the English Channel, unlike the other islands, which lie in the Bay of St Malo! Alderney is often referred to as CINDERELLA ISLAND, rather quaintly referring to the most northerly island as having two bigger “ugly sisters” – Guernsey & Jersey!